I knew could be done. Here's a quick and delicious example. Jam, a simple way to preserve the abundance of fruit this season will bring. Glancing at the back of most jam jars I never figured it could be as easy as 2 or 3 natural ingredients. 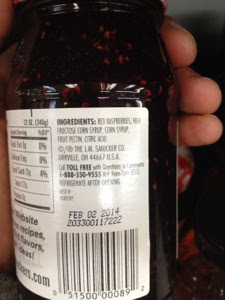 I figured since I didn't have high fructose corn syrup, corn syrup, fruit pectin and citric acid, I should just keep myself from attempting to make jam. Preserving fruit is an art form, a skill that must be developed over time through practice. As I watched our pro and author of "The Blue Chair Jam Cookbook," Rachel Saunders, I began to see the precision that was used to make a perfect jam. Rachel, based out of Oakland, CA owner and founder of the Blue Chair Fruit Company and author of various jam related cook books, guided us through an active demonstration right in the Blue Hill pastry kitchen. For this class, Rachel taught us how to make a strawberry jam with a nutmeg-geranium infusion and strawberry, rhubarb jam with an orange-thyme infusion. With or without the herbs it's a simple process, it just takes time and patience. The only other ingredient added was a bit if lemon juice. 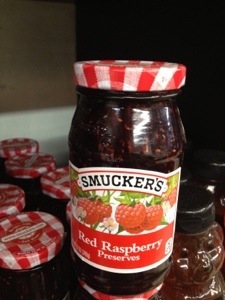 Jamming is cooking down fruit and releasing all of the moisture so that all is left is a spreadable consistency. The difference between a thick and thin jam is a matter of one or two minutes so it's important to stay close throughout the entire process. It took around an hour to complete our two jams. The process involved washing and chopping the fruit and rhubarb stalks, covering the fruit in lemon juice and cooking it down in a large pot. No water was added, no sugar was added. Stirring is important to ensure the fruit is not sticking to the bottom of the pot. Sticking is the warning sign for burning, If you go too far there is no turning back ( don't worry I asked about that), it's like toast you can't unburn toast so more testing is always better at first. There is so much water held in fruit and rhubarb that it seemed as though water was added while cooking, but fruits such as strawberry and stalks of rhubarb are filled with water naturally. So once the heat releases the water from the fruit, a foam will develop and it's best to skim that off throughout the process. By skimming off the foam, you will be left with a beautiful, deep red jam. Once we were close to the thick consistency we were looking for, Rachel added in the herbs and simply let them steep for about 5 to 10 minutes before they were removed and the jam was complete. Finally, we poured the hot jam into sterilized glass jars. The higher the pour, the less air can get in and the longer the jam will last. A great class and a lot of great tips for jam making. One valuable take away is if you want a chunkier jam, just chop thicker pieces. The bigger the fruit the less it will breakdown.